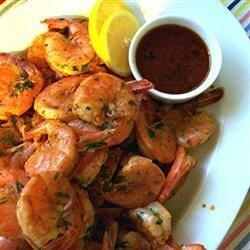 "This is an amazing spicy grilled shrimp recipe. It has become my family's new favorite." Whisk together the olive oil, sesame oil, parsley, hot sauce, minced garlic, ketchup, chile sauce, salt, pepper, and lemon juice in a mixing bowl. Set aside about 1/3 of this marinade to use while grilling. Place the shrimp in a large, resealable plastic bag. Pour in the remaining marinade and seal the bag. Refrigerate for 2 hours. Preheat an outdoor grill for high heat. Thread shrimp onto skewers, piercing once near the tail and once near the head. Discard marinade. Lightly oil grill grate. Cook shrimp for 2 minutes per side until opaque, basting frequently with reserved marinade. Simple and easy grilled shrimp! I gave this 3 stars because, although I didn't like it, my bf did. I just didn't not like the sesame oil. I even used less than called for. This was a very great recipe and pleased my taste buds! I also added steak and cucumbers and doubled the marnade so I had shish kabobs! they tasted so good! Excellent flavor! We like it hot, so for the hot sauce, I used 1 tablespoon of regular Tabasco and the 2nd tablespoon Habanero Tabasco. Absolutely perfect!